Leeda's Profil is a new high quality, copolymer tippet material for the modern fly fisherman in handy 50m spools. Ability to feel gentle takes. Supplied on a 50m spool. 7X - 3lb - 0.12mm. 6X - 4lb - 0.14mm. 5X - 5lb - 0.16mm. 4X - 6lb - 0.18mm. 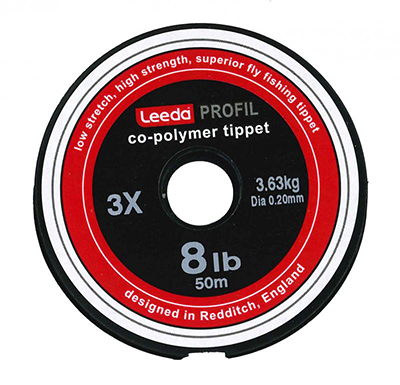 3X - 8lb - 0.20mm. 2X - 10lb - 0.22mm.